Moving to uniforms supports our Forcey Christian School core values of professional dress, positive behavior choices, and a sense of belonging to the FCS Community. 1. 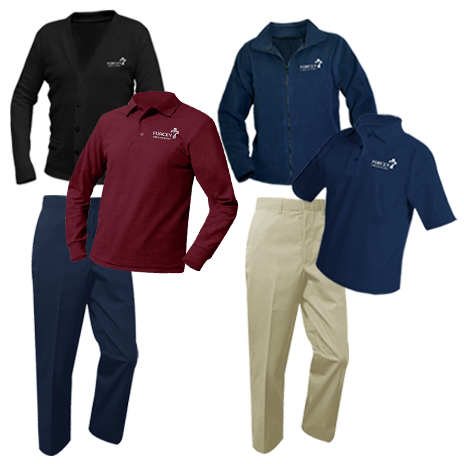 Long or short sleeved light blue, navy blue, royal blue, or maroon polo with FCS logo purchased from Flynn and O’Hara. 2. Khaki or navy cotton pants. These can be purchased from Flynn and O’Hara, Walmart, JC Penney, or Old Navy. 3. Navy Fleece with FCS logo purchased from Flynn and O’Hara. 4. Black sweater with FCS logo purchased from Flynn and O’Hara. 1. Long or short sleeved light blue, navy blue, royal blue, or maroon polo with FCS logo purchased from Flynn O’Hara. 2. Long or short sleeved white peter pan blouse with FCS logo purchased from Flynn and O’Hara. 3. Khaki or navy cotton pants. These can be purchased from Flynn and O’Hara, Walmart, JC Penney, or Old Navy. No jeggings or leggings. 4. Khaki or navy blue skort purchased from Flynn and O’Hara or any uniform supplier (Old Navy, Walmart, Target, JC Penny). These may be worn with tights or socks. 5. Navy Fleece with FCS logo purchased from Flynn and O’Hara. 6. Black sweater with FCS logo purchased from Flynn and O’Hara. 1. Grey t-shirt with FCS logo purchased from Flynn and O’Hara. 2. Navy gym shorts with FCS logo purchased from Flynn and O’Hara. 3. 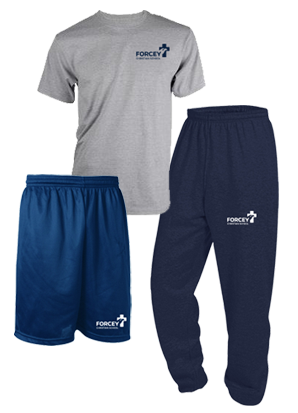 Navy sweat pants with FCS logo purchased from Flynn and O’Hara. Black or brown close toed shoes. National Association of Elementary School Principals (NAESP) and Lands’ End. “National Survey of School Leaders Reveals 2013 School Uniform Trends.” July 30, 2013, www.naesp.org/national-survey-school-leaders-reveals-2013-school-uniform-trends.